I learned about the Philadelphia Ride for Kids through my EZ Riders Scooter Club membership. This was a great event benefiting the Pediatric Brain Tumor Foundation. I got to ride with 100 other motorcyclists for a police-escorted 40 mile ride. Intersections were guarded - didn't even have to put our feet down! 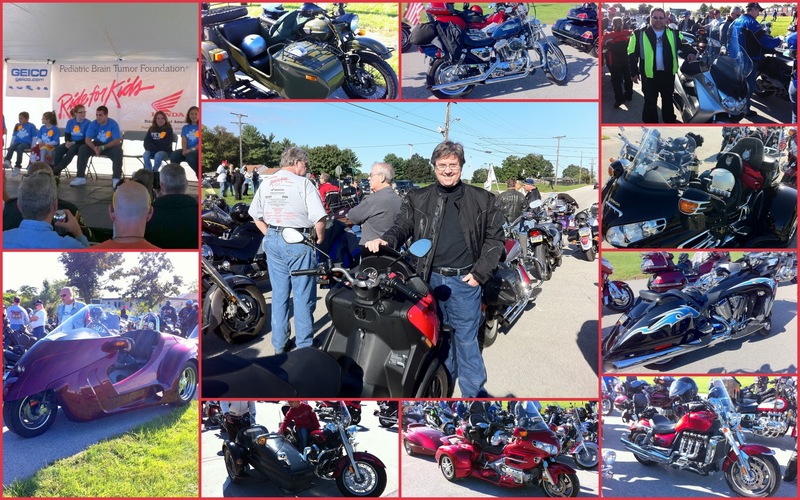 "When you join hundreds of other motorcyclists for this scenic ride through the Pennsylvania countryside, you'll have a great time while raising funds for the PBTF's medical research and family support programs! Riders on all makes and models are welcome. The police-escorted ride starts at 10 a.m. sharp, rain or shine! After a light lunch, participants will enjoy a Celebration of Life program that features interviews with young brain tumor survivors—the Ride for Kids® "stars" of the day." Some very interesting bikes and people. That's me in the center frame.